Uses sound waves to produce pictures of the carotid arteries in the neck which carry blood from the heart to the brain. We all have two carotid arteries, one on each side of the neck. 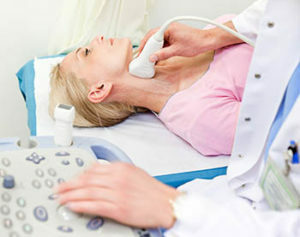 A Doppler ultrasound study – a technique that evaluates blood flow through a blood vessel – is usually part of this exam. Ultrasound technology is non-invasive and does not cause any pain or discomfort. Yet modern ultrasound generators offer our physicians the precision needed to accurately diagnose whether plaque has begun to build up in the carotid arteries. Carotid artery disease, which can lead to stroke, is commonly diagnosed using this diagnostic modality. A diagnostic test which uses ultrasound waves to make images of the heart chambers, valves and surrounding structures. EKGs are minimally invasive and only require the placement of 10 to 12 leads on the body (typically four on the extremities and 6-8 on the chest). It can measure cardiac output and is a sensitive test for fluid around the heart (pericardial effusion). 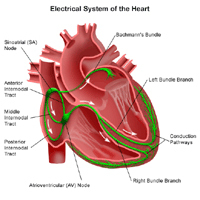 Learn more about electrocardiogram (EKG). The most widely used cardiac (heart) screening test. The patient exercises on a treadmill or receives a medication simulating exercise according to a standardized protocol, with progressive increases in the speed and elevation of the treadmill (typically changing at three-minute intervals). During the exercise cardiac stress testing (EST), the patient’s electrocardiogram (EKG), heart rate, heart rhythm, and blood pressure are continuously monitored. Portable devices which continuously monitor the heart rhythm for 24 hours to 30 days to detect abnormal heart rhythms responsible for palpitations, dizziness, or fainting spells.